There are a number of lakes in North America that hold what I call "super trout." These are unique bodies of water with rainbow trout that have the genetics and food sources to grow into the 20 lb-plus class. 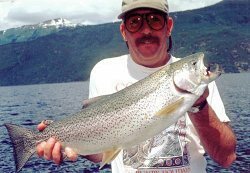 Kootenay Lake, Lake Pend Orielle, Naknek Lake and Lake Illiamna are probably the most well known of the super trout waters due to the number of fishing camps that service them and their tributaries. But the big four are not the only places where we find super trout. Lesser-known Quesnel Lake in the Cariboo region of British Columbia is another. Quesnel is probably the best kept fishing secret in all of North America largely due to the few outfitters on the lake and its remoteness. I rate Quesnel Lake as one of the top 10 big trout waters on this continent. One of the reasons that Quesnel has such big rainbow trout is that the lake is a large body of water. Quesnel has a length of 120 km (75 miles) and is the deepest and longest fjord lake in North America. 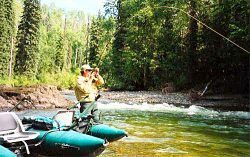 An initial inspection may give you the impression that Quesnel is a small sea and, just like the blue waters, the lake holds numerous fish species, including lake trout, Dolly Varden, sockeye, kokanee and the rainbow trout. This is not just a big trout fishery. There are smaller rainbows, from two to four pounds, that cruise the shorelines of the lake where they feed on insects and can be easily caught. But the trophy hunter will concentrate on the large mature fish. The alternative is much like I explained to a hunting companion that was chasing a blacktail deer on a bow-hunting trip for elk. "You don't stick a doe when there are big bulls around." The key to hunting the trophy rainbows is to understand their food source - the kokanee and sockeye salmon adults and smolts. These prey fish often feed on or near the surface in open water on zooplankton and that is the best time to hook into the big rainbows. Other opportunities are when the rainbows are migrating to spawn in or feed at the mouths of the nearby Horsefly and Mitchell rivers. The sockeye also migrate in and out of the lake and the kokanee spawn in the lake. Both of these periods are opportune to catch the big rainbows that feed on them and their eggs. This is a large and complicated lake and best approached with the assistance of an experienced guide. Quesnel Lake is suitable for conventional angling and trolling fly fishing with large streamers. You are not going to be casting from a float tube on this lake, although numerous opportunities exist on the smaller waters nearby. 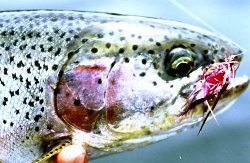 Remember that the rainbows are feeding on the kokanee that are in turn feed on the zooplankton, which are feeding on the phytoplankton out in the lake. The wind and current are shuffling around the phytoplankton and zooplankton. The kokanee are moving a lot faster than you can catch up and then cast to so trolling is essential. The big rainbows are also solitary predators and the spacing between them can be considerable. 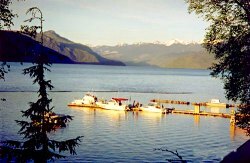 Elysia Resort on the southern shore of Quesnel Lake provides sturdy boats with reliable motors, guiding services, solid meals and fishing-camp style lodging. I highly recommend Elysia as a place to start. My book BIG TROUT Fly Fishing can also help you to learn more about the gear and tactics required for this unique style of fly fishing. Bernie Taylor is a freelance outdoor writer and photographer. 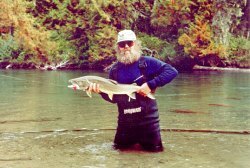 His currently book BIG TROUT Fly Fishing is published by The Lyons Press.